With its many beautiful beaches lakes, you can experience all four seasons in Lithuania. Want to visit a wonderful country on the Baltic Sea? With its many beautiful beaches lakes, you can experience all four seasons in Lithuania — a hot and sunny summer, a multicolored autumn, a snowy winter, and a green spring! Looking to find a wonderful European country on the Baltic Sea? Then search no further; Lithuania is a great place for your exchange year! Lithuania has many beautiful beaches, both on the Baltic coastline and by numerous lakes and rivers. You can experience all four diverse seasons in Lithuania; a hot and sunny summer, a multicolor fall, a snowy, chilly winter and a green spring. Vilnius, the capital of Lithuania, is one of the largest and prettiest cities in Eastern and Central Europe and is included on the UNESCO World Heritage List. Vilnius has always been a multinational, multilingual, and multicultural European city, thus making it a European Capital of Culture. This city is home to many historical structures, such as the great Lithuanian Art Museum, the largest art museum in all of Lithuania. 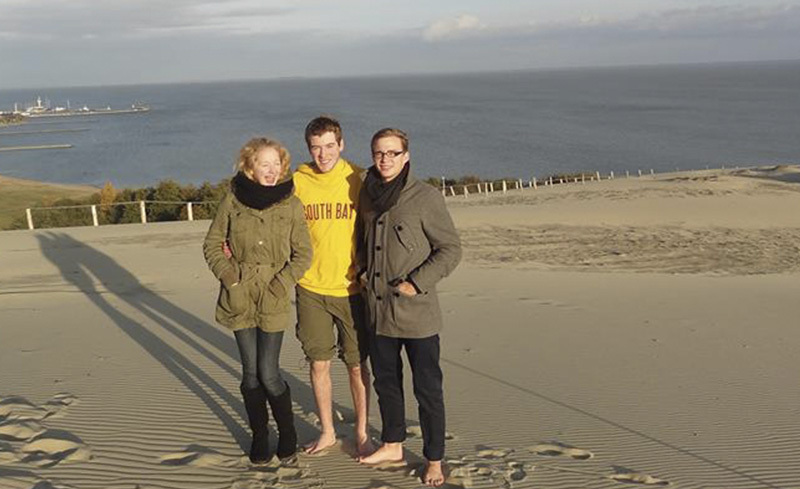 While the majority of YFU Lithuanian host families reside in apartment buildings or private houses in cities, students may have a chance to be placed with a host family that lives in a small town or village, a more traditional setting. However, many cities throughout this beautiful country have a strong, historical presence with the Corded Ware culture that dates back to the Stone Age! The education you will receive in Lithuania is among the best in Europe; the country has twice as many people with advanced education as the average of the European Union. Lithuania is also quite multilingual; the overwhelming majority of the population speaks at least one foreign language, and about 50% of the population speaks two foreign languages. For relaxation, Lithuanian families regularly gather in the evening to tell each other about their day or to make plans for spending time together. As a part of a host family, you may be invited to attend theaters, concert halls, and exhibitions, which are among the favorite activities for any Lithuanian family. Choose Lithuania and you will explore the beautiful outdoors, warm people, and a wide range of great traditional food. Make sure to ask about our sports program - basketball is the national sport in Lithuania! In order to travel to Lithuania, students must have a visa before they arrive. Information regarding visas and other immigration processes will be provided upon enrollment. Schools in Lithuania have twelve grades and emphasize academic performance. You will take classes at the upper secondary level in a wide variety of subjects including math, social science, literature, foreign language, history, politics, biology, chemistry, physics, computer science, music, art, and sports. Most of the subjects are compulsory, but you will have a chance to choose some specific subjects that suit your particular interests. Intensive individual language training is essential for the first months after arrival. Students will have 2 individual lessons and 2 group lessons per week with the professional language teachers. All students applying for the semester or year program must be available for a mandatory 3-day National Pre-Departure Orientation, which usually takes place in mid-July. This orientation is a required part of the program aimed at preparing students for their experience overseas. All students will participate in a one-day local pre-departure orientation in May or June. Upon arrival in Lithuania, students will attend a three-day post-arrival orientation, where they will receive basic language and culture training. Year students attend a three-day mid-year orientation, and all students attend a three-day re-entry orientation to reflect on their experiences. All orientation costs are included in program tuition. Volunteers will also organize additional activities for students — a Christmas party, cooking class or other fun activities may be in your future! The YFU Road Trip is also offered to all students in November — the four-day road trip takes students around the country and is organized by a team of volunteers. Students will stop along the way to explore the cities, the countryside, museums, nature, unique architecture and lots of other cultural sites that Lithuania has to offer! This trip is a great way for exchange students to get to know their new home. There will be an optional trip to Lithuania's neighboring countries of Estonia and Latvia. At an additional cost, students can explore these three Baltic beauties known as the "Three Sisters." Students will visit Riga, the capital of Latvia, and Tallinn, the capital of Estonia, during the trip. Students will learn more about cultural expeditions upon arrival in Lithuania. Fall Programs: January 1, 2002 - September 1, 2004. Students who do not meet this age requirement before the start of their program will be considered for high school programs on a case-by-case basis. Lithuanian. Previous language study is not required. Students may be placed throughout the country in cities such as Vilnius, Kaunas and Klaipeda. Most placements are in urban or suburban areas. Sport For Understanding (SFU) Program - Basketball Player: It's no exaggeration to say that basketball is the most popular sport in Lithuania — natives joke that basketball is the country's second religion. For millions of people all over the world, it was precisely basketball and its star players such as Arvydas Sabonis or Sarunas Marciulionis that put the name of Lithuania on the map. YFU USA offers a year exchange program to Lithuania that focuses on team basketball! YFU participants will live with a carefully selected host family, attend a secondary school and enroll in a specialized basketball school after school. Students applying for this program should have 2 or more years of high-level, team-based basketball experience. You will train and play competitive team basketball 3-6 times per week after your classes. In addition to this, advanced teams have games and matches on weekends where they play in national and/or international leagues. Less advanced ones play less matches and have more games between other teams in the same school or teams of the same level from other schools. Students on this program will be required to pay an additional basketball school fee (maximum €130 per month). This fee will be paid to the host school directly by the participant. Lithuania has very high standards in basketball — if you are a student who is interested in basketball, you will get very good training! Additional documentation proving technical skills and abilities may be required. For additional information, please email info@yfu.org to get in touch with a representative. Basketball Fan: Students that are interested in basketball, but do not wish to play competitively, also have the option to go on a basketball fan program! In addition to attending a local high school and living with a host family, students will be enrolled in a fan club of one of two most popular basketball teams in Lithuania - Zalgiris (Kaunas) or Lietuvos (Vilnius). As part of this enrollment, students are granted season tickets to all of their team's home games. They will attend basketball games in their host city and around Lithuania.